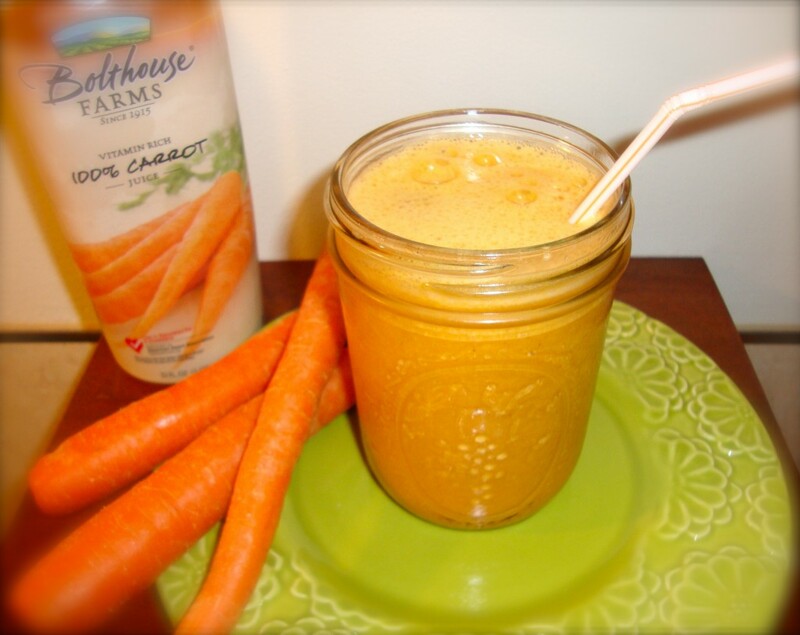 You’ll be saying YES to carrots after just one sip of this amazing smoothie. 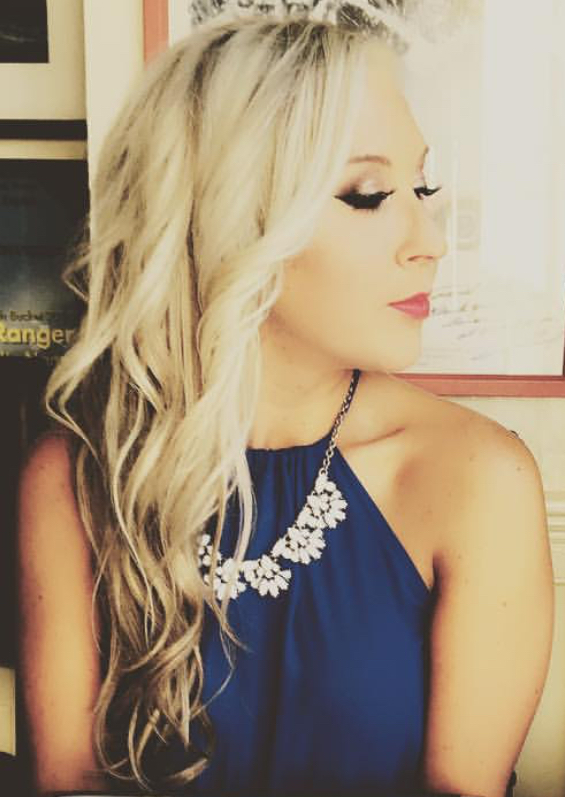 A few weeks ago I came across fresh-pressed carrot juice at the grocery store. I was feeling kind of adventurous on that particular day, so I tossed a bottle into my basket without much thought and decided to give it a try (I was really getting into my green smoothie kick at the time, so new juices were kind of my “thing”). Boy OH boy am I glad I did! After the very first sip I was instantly HOOKED. I mean, I’ve always been a carrot-lovin’ gal, but who knew carrot juice could be so INCREDIBLE!? Unlike other veggie juices like V8, fresh carrot juice is delightfully sweet, smooth, refreshing and low in sodium. It’s also extremely versatile. 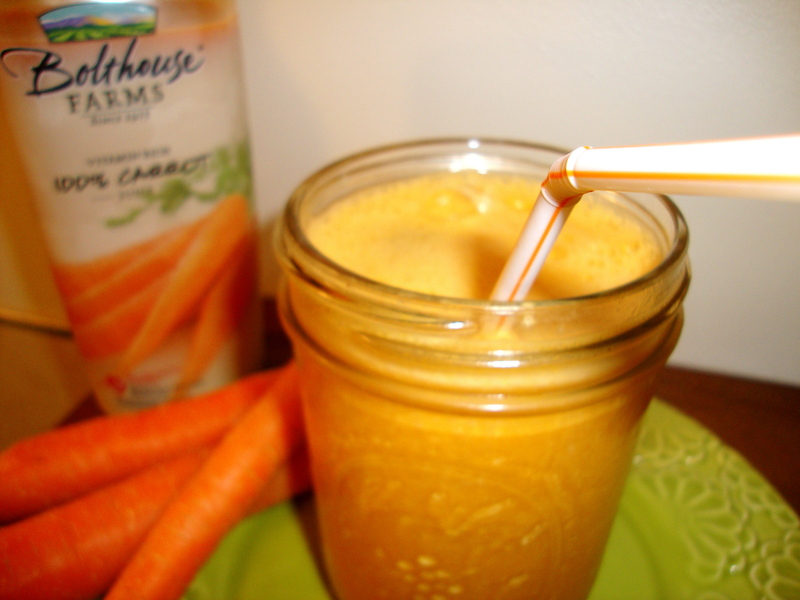 Carrot juice tastes just as wonderful on its own as it does blended with other fruits and veggies. That’s when my wheels started spinning, and my carrot juice smoothie was born! But first, allow me to share some nutritional benefits of our sweet, crunchy, and orange root vegetable friend known as the carrot. Prevents cancer: Studies show that eating carrots can help to lower the risk of cancers (particularly colon, lung and breast cancer) due to its high levels of beta-carotene and other key cancer-fighting compounds. One of the main cancer-fighting compounds researchers have found is known as falcarinol, which acts as a natural pesticide and protects the carrot roots from fungal disease. Researchers believe this compound, along with beta-carotene, is the key ingredient that makes carrots such a great a cancer preventing veggie. Research has also shown that the high amounts of soluble fiber found in carrots can reduce colon cancer risk by 24% and women who eat raw carrots are five to eight times are less likely to develop breast cancer than those who don’t eat carrots at all. Prevents heart disease: Studies show that regular consumption of carrots can reduce cholesterol levels (a marker for heart disease) while a diet high in carotenoids (found in carrots) is proven to reduce overall risk for heart disease. Carrots are also high in soluble fiber, which is known to help lower blood cholesterol levels. Reduces the risk of stroke: Studies show that a carrot a day can reduce stroke risk by 68%, and research conducted on stroke patients has indicated that people with high levels of beta-carotene in their diet have the best survival rate. Controls diabetes: The carotenoids present in carrots inversely affect insulin and therefore can help to lower blood sugar. Improves vision: Carrots are rich in vitamin A. Deficiency in this vitamin can make it difficult for someone to see in dim light, but because carrots are so high in vitamin A, they can actually help to improve eyesight. Carrots can also prevent macular degeneration and cataracts, two common eye diseases of the elderly. The lutein and zeaxanthin in carrots help to prevent cataracts while the beta-carotene in carrots help to lower the risk of macular degeneration and cataracts by 40%. Nourishes skin: The vitamin A in carrots is great for nourishing the skin. It can also fix uneven skin tone and pigmentation while making skin softer, firmer, and smoother. 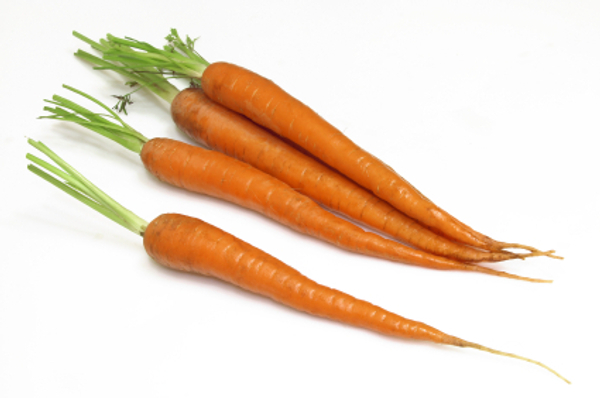 Carrots also have strong cleansing properties which helps to detoxify the liver and prevent/heal acne. Improves gastrointestinal health: Carrots are rich in dietary fiber which keeps the gut and colon healthy and regular. Has anti-aging properties: Beta-carotene acts as an antioxidant which fights against free radicals and helps to slow down cellular aging. Now, back to my smoothie recipe! Toss everything in a blender and blend until smooth. Livestrong: How are Carrots Healthy?